Politics - a rough trade.. So NU led by Vyacheslav Kyrylenko have formed a election bloc with Yuriy Lutsenko's National Self-Defence 'party'. Yuliya Tymoshenko has given this union her blessing, but has again emphasized that BYuT will be campaigning separately. Yushchenko 'pulled the plug' on the Verkhovna Rada in April, four years before the next VR elections were due, because power was haemorrhaging from the presidency, yet most O.P. 's indicate the newly elected parliament's composition will be little different to that which was elected in March last year - PoR will undoubtedly be the largest bloc, and events since the OR suggest that any BYuT/NU coalition would not be durable, if it could be assembled. BYuT and NU will again be fighting over the same electorate - one party's loss will be the other party's gain. Whether the president's forthright actions since April 2nd have contributed to democratic consolidation is debatable. Ukrainian politics over the years is replete with betrayal and treachery, and there is no reason to believe this state of affairs will not continue in the newly elected VR. Sonya Koshkina, in a provocative article in the BYuT-leaning 'Obozrevatel' claims that Yushchenko is preparing to 'shaft' some of his orange assciates, in particular Tymoshenko, as part of a plan to win a second presidential term of office in 2009. The formation of a democratic mega-bloc has fizzled out, as could have been predicted, in many respects because Yushchenko himself has personally taken over manual control of the process. He has done this in order to simultaneously neutralize both Lutsenko and Tymoshenko - two of his main opponents in the 2009 presidential elections. Once this is accomplished, then he can tackle Yanukovych. Current NU leader Vyacheslav Kirilenko is not a crowd-pulling political heavyweight so Yushchenko has bowed to former socialist Yuriy Lutsenko's demands and promised many of his National Self-defence people top jobs in any NU government, in exchange for his joining forces with NU. In this way the popular Lutsenko may be kept in check. The smaller right-wing parties in NU will probably be dumped. However, Lutsenko's appearance in the orange bloc reduces the chances of a broad coalition being formed, and could even threaten the elections themselves, according to some PoR party workers. Sonya Koshkina claims that Viktor Yanukovych agreed to take part in early elections only because the president had promised him that NU and "Regionaly" would form a broad ruling coalition after the elections. They also secretly mutally agreed to 'knobble' Tymoshenko. About a week befor Ivan Plyushch's appointment as National Security and Defence Council secretary he contacted that old political fixer, the Donetskiyite Yefim Zvyagilskiy. These two senior statesmen outlined a plan between themselves to overcome the crisis by forming a broad coalition, and this meant combined action against Tymoshenko. They then met head of the pres's secretariat Viktor Baloha, and further plotting took place - the president being well aware of what was going on. Subsequently Rinat Akhmetov and Raisa Bohatyryova met Yushchenko, who later praised Akhmetov for his assistance in solving the political crisis. Mutual dislike of Tymoshenko is the only factor that Yu and Ya share - both have presidential ambitions, so both need to remove Tymoshenko from their path. According to Koshkina, they are both planning a dirty election campaign, which could even involve the SBU security services, to discredit Tymoshenko. O.K, this all could be speculation and 'provokatsiya', but politics in Ukraine is a rough trade..and the elections are a long way off..
A law court of Kiev has partially satisfied a legal action submitted by joint stock company "Dniprovagonmash" and ruled that the sale of 76% of the shares of "Luhanskteplovoz " to the Russian buyer "Bryansk Machine Building Plant" was illegitimate. Furthermore they considered that the shares should be returned to the Ukraine State Property Fund. The court also ruled that "Dniprovagonmash" should have been permitted to take part in the tender competition. Mysteriously, only two Russian companies, which are affiliated to one another, were allowed to take part - Bryansk Machine Building Plant's bid of $58.5 million proving to be successful. Independent investment assessors had valued the packet of shares on offer, together with a controlling premium, at around $100 million. "Dniprovagonmash" is linked to some of the richest Ukrainian businessmen, Dnipropetrovskiites Serhiy Tyhypko, Ihor Kolomoysky, and Gennadiy Boholyubov. Will the State Property Fund's leader, Socialist Valentyna Semenyuk be sacked? Will the court's ruling be challenged/ignored? Russia and Italy have signed a memorandum of understanding to build a gas pipeline between their countries - the so-called ''South Stream'', which, if constructed, will significantly increase Russia’s options to play consumer countries, transit countries, and various national energy champions in Europe against each other. 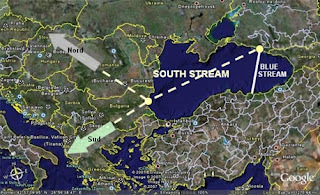 'South Stream' includes a hugely expensive 900 km link under the Black sea to Bulgaria. The 'South Stream' would reduce Ukraine's leverage on Russian exports of gas to Europe, a major portion of which are currently piped through Ukraine. An article in today's 'Gazeta po Kiyevski' entitled 'Gas pincers' suggests that the memorandum of understanding may be a ploy by the Kremlin to gain more control over Ukraine's gas transit system and to obtain a higher price for their gas to be negotiated this autumn. On 23rd June the Italian gas monopolist ENI and Russian "Gazprom" signed a memorandum on the building of major gas pipeline under the Black sea. Naturally there was not a word about participation of Ukraine in this project. Moscow is trying to scare us with the familiar thesis: if you do not want to give up your gas transport system, then we will bypass your country. However, in the opinion of experts, the Kremlin's threats are more words than real actions, and are intended to thoroughly frighten Ukrainians so that they become more compliant. "This is an important and very promising project, which will contribute to an improvement in the energy situation in Europe as a whole," according to Vladimir Vladimirovich Putin. Despite the fact that it is intended a substantial part of the pipeline will pass through their territory, the Bulgarian's didn't know too much about it, apparently because of the rush to publicly flaunt this grand new project. Only on the next day, 24th June, did Putin promise to discuss the idea of "'South Stream' with the Bulgarian President. This is the second gas pipe Russia intends to construct in order to bypass Ukraine. The first - "North Stream", is to be laid along the bottom of Baltic sea to Germany. The Kremlin is systematically removing from our country the status of main gas transit route into Europe as revenge for our unwillingness to share our own gas transit system with them. Belorussia, which is second in significance to us as as a gas transit power, has practically handed over its entire oil pipeline system to "Gazprom". Frankly, the Kremlin's projects by no means coincide with their statements about common economic interests and the "Ukrainian partner being a reliable transit country". Reading between the lines, Russian officials constantly hint that any joint projects with Ukraine are possible only in exchange for participation in a common gas transit system. The article then refers to the National Security and Defence Council meeting which took place on 15th June, about which I posted recently. It was expected that the President Viktor Yushchenko would give the government a 'roasting' for their carefree attitude to the diversification of sources of fuel, for the monopolistic status of "RosUkrEnergo", for hindering the utilization of the "Odessa-Brody" oil pipeline, and for the totally incomprehensible attitude of 'MinTopEnergo', headed by Mr. Yuriy Boyko in negotiations with "Gazprom" on the future price of gas. It is completely incomprehensible how they are negotiating and on what conditions. However, as usual, the NSDC session took place very quietly and peacefully. No decisions and no disciplinary measures were adopted. Only Boyko was scolded a litte, just for the sake of appearances. There is some good news. In spite of the Kremlin's 'big talking', the ''South Stream'' gas pipeline will hardly be successfully built in the near future - there are many serious technical and financial problems. The same may be true of the Baltic "North Stream", which could be blocked by Poland and Estonia into revenge for the Kremlin's "energy blackjack". At the moment this is all intended to frighten Ukraine in advance of the autumn negotiations. Everyone knows Gazprom intends to raise gas prices significantly in 2008, and it's possible that the "'South Stream'" will be used by the Kremlin to increase pressure. If they succeed will depend on the response our politicians. - The discussions [on 'South Stream'] are about feasibility. The project will be expensive and complicated. Firstly there's the complicated task of laying the pipelines under the Black sea, then building powerful compressor stations on the Russian shore, necessary to drive gas more than 900 km. Secondly, at the moment there is no agreement on the participation in the project of Bulgaria. It took more than 13 years to sort out the building of the Burgas-Aleksandrupolis oil pipeline with Bulgaria. Furthermore, by using a similar pseudo-project, Moscow wants to pressurise Turkey into accelerating construction of a second 'Blue Stream gas pipe" [which also passes under the Black sea]. LEvko thinks 'North Stream' makes some sense because it directly connects supplier Russia with consumer Germany. ''South Stream'' assumes Bulgaria will be a more reliable transit country that Ukraine, but can this assumption be made? Information notes [dovidka] for meeting of National Security and Defence Council meeting to be held on 15.06.2007: "On the state of progress of execution of NSDC resolutions on questions of energy security." "2. Main threats in the energy security sphere. 2.1 Particular alarm is aroused by the negative tendencies in the internal gas market. From 2006, Ukraine has only one supplier-importer of natural gas -RosUkrEnerho, which has also become the monopolistic supplier of gas to Ukrainian enterprises (via UkrHazEnergo joint venture). The main threat to Ukraine in the medium term in the context of energy security remains the lack of guarantee of supply of natural gas at acceptable price for 2008 and subsequent years. ...there is a real threat to the energy security of Ukraine caused by the high degree of monopolisation, and the corresponding unacceptably high risks of price diktat by the monopolist supplier; and also by the absence of guarantee of long-term supply of gas at acceptable prices. As a result, because of potential debt dependence, a threat of loss of assets [to pay for these debts] has arisen. [These include] transit pipelines, gas distribution networks, and gas storage reservoirs, as well as consumers' assets - industrial enterprises and so on. The information laid out above provide grounds to declare that in the gas sector of the fuel-energy complex, systematic threats to the energy security of the state are growing." There's a lot more worrying stuff too, e.g. about hindrances to the introduction of market principles in the coal industry, and lack of competition in the sphere of export of electric energy. At that NSDC meeting itself, government representatives, Minister of fuel and energy Yuriy Boyko and vice-premier Andriy Klyuyev, claimed that the problems were exaggerated, and that there is nothing to worry about. As I posted, previously, some of those present rushed through the NSDC meeting because they were attending Elton John's bash in Kyiv, later that day. LEvko thinks there is a sense of unreality in all of this - of sleepwalking to disaster. Who is going to address these problems? p.s. Good analysis on this in last last week's 'Dzerkalo Tyzhnya' in English here. Here's their conclusion: "...it is evident that the problem will remain unsolved without the consolidated efforts of all political forces around a clear and well-calculated strategy of energy security. As long as the top positions in this country are occupied by people that are personally interested in companies like RUE, Ukraine will be getting bogged down deeper and deeper in the slough of someone else’s interests." Today's 'FT' runs an interesting story [see below] about monopolist gas trader RosUkrEnergo, and the problems being encountered by its Ukrainian owner, Dmytro Firtash, in the divorce courts. The case, which involves his his former wife Maria Mykhailivna Firtash, could affect ownership rights over his multibillion-dollar commercial empire. When the pair were divorced two years ago, it is unlikely that the courts would have been aware of Firtash's 45% share of the shadowy Swiss-registered RUE, so she may have a case. Even president Yushchenko famously claimed ignorance of RUE's Ukrainian owners. I have posted previously about Maria Firtash's step-son Serhiy Kalynovsky and his involvement in the fatal May 30th car smash mentioned in the 'FT' story, and the subsequent attempt to spirit him out of the country by 'plane dressed a a girl. He had previously pledged in court not to leave Kyiv. A couple of days ago Serhiy Kalynovsky was found guilty of causing the 'accident', and fined 34 hryven [about $7] for speeding. In May 2005 Serhiy Kalynovsky and his brother Oleksandr badly beat up a DAI [road cop] inspector who was giving them a parking ticket. Even though the cop sustained quite serious head injuries, the case against the two brothers was dropped. Nice to have rich and powerful parents who can fix things..
Ukrainian businessman Dmytro Firtash is embroiled in a bitter divorce that could affect ownership rights over his multibillion-dollar commercial empire, including a company controlling natural gas supplies to Ukraine and the European Union. Mr Firtash this week hoped to boost the transparency of his portfolio of holdings, announcing that key assets, including Swiss-registered gas trader RosUkrEnergo, which he owns in partnership with Russia’s Gazprom, had been consolidated under a new holding, Group DF (GDF). But a divorce dispute with his ex-wife, Maria Firtash, has cast a shadow over the consolidation plans. It also raised doubts about Mr Firtash’s ability to hold on to majority interests in the lucrative gas trade, in television channels in Ukraine, and in property and chemical companies scattered across former Soviet states. In a statement on Friday, Mr Firtash announced the formation of the Vienna-based GDF under which he has consolidated most of his assets. Robert Shetler-Jones, GDF’s British chief executive, said: “The formation of GDF reflects the group’s desire to have a clearer, more unified structure for its business interests, one that is transparent, and which will provide a platform for access to competitive financing terms to support the group’s ambitious business expansion.” Having been earlier owned by a complicated web of offshore companies, GDF’s companies posted $4.6bn in consolidated revenues as of December 31 2006. The prime asset of the 42-year-old businessman is a 45 per cent interest in RosUkrEnergo. The trading and distribution company controls the supply of Russian and central Asian gas to Ukraine, and further to European markets. Hungarian gas trader EMFESZ and a Vienna-based chemical holding, Ostchem, were also brought into GDF. “This is the first step” towards possible IPOs, Mr Shetler-Jones said, adding that individual companies could be ready for a listing on a major European market within two years. But a family feud could challenge Mr Firtash’s bold plans. In a Financial Times interview, Maria Firtash said she would seek a 50 per cent interest in the businesses, or equal compensation, through litigation. She claims to have played a major role in setting up the businesses. Ms Firtash, who is 51, was in her mid-30s when she met Mr Firtash in the early 1990s and nearly a decade older than Mr Firtash. She said they initially worked together in what was largely her business. Later she promoted Mr Firtash to commercial director of her business and married him in 1996, she said. “Later I gave him legal rights over many of these businesses. I had licences and traded in gas. We traded in foot products, traded in many things. This was our joint work,” she said. The mother of two has challenged a divorce settlement that she signed almost two years ago. The package is said to be valued at tens of millions of dollars. She claims not to have received full compensation and argues that the settlement was not legally sound to begin with. The former couple have clashed in Ukrainian courts. On May 11, Kiev’s Pechersky district court ruled the divorce settlement agreement non-binding. Mr Firtash is expected to appeal. Ms Firtash pledged to fight to the highest jurisdiction to gain control over half of the assets. “I will file lawsuits in all countries,” she said. The mother and her other son, 23-year-old Oleksandr Kalynovsky, have accused Ukrainian officials of dragging their feet in the investigation of the accident. Yellow is June, green is May. Only 28% of Ukrainians think that the early elections will solve the current political crisis. The majority think otherwise. These numbers explain why there is much behind-the-scenes talk of an PoR-NU coalition - the only one which would provide some stability. There is continued speculation of rifts in PoR between Viktor Yanukovych and 'king of Donbas' Rinat Akhmetov; and that after the VR elections a PoR-NU coalition could be formed with, possibly, Akhmetov-loyalist Boris Kolesnikov heading the cabinet of ministers. 'Ukrainska Pravda' says that Akhmetov wants to earmark at least 50% of the PoR party list for his men in the September VR elections. The writer thinks Yanukovych will be appointed at best, Donetsk oblast governor, and suggests that Akhmetov and the president have done a deal: "The president will close his eyes to any falsifications in the east of the country in favour of PoR, and in return PoR observers will take no attention of hundreds of thousands of western Ukrainians working abroad 'casting their vote' during the elections." One of BYuT's top men, Mykola Tomenko, when asked in an interview with UNIAN about forming coalitions says: "I will voice two reservations with respect to "Our Ukraine". There is [NU leader] Vyacheslav Kirilenko, whose position is very close to our's, but there are Ivan Plyushch and Yuriy Yekhanurov, who have always remained supporters of a wide coalition with Party of Regions... so the possibility of wide coalition with the participation of NU remains. Therefore I consider clear guarantees should be given not so much to the political forces, as to the voters." "If someone, somewhere, beyond Kyiv is conducting negotiations with the beneficial and effective manager Rinat Akhmetov, then, obviously, certain questions spring up about other coalition creation scenarios involving participation of NU, but without BYuT. Opponents of Viktor Yushchenko say that his team are working so as to allow neither Yulia Tymoshenko nor Viktor Yanukovich to become premier. Other scenarios suit them, because then the road for the current president will be clear for the next presidential elections." Akhmetov wants more of 'his people' in the VR and in the cabinet, and wants his man as PM in a PoR-NU coalition government in the event that PoR do not achieve an absolute majority. Is he offering Yushchenko an unopposed run in the 2009 presidential campaign in exchange? LEvko thinks this is a tantalizing offer.. The second summit of the Organization for democracy and economic development - GUAM [Georgia, Ukraine, Azerbaijan Moldova] is taking place in Baku today and tomorrow. The Ukrainian delegation is headed by the President Yushchenko; the Polish president Lech Kaczynski is present too. Also attending are presidents Aliyev and Saakashvili, as well as Moldovan PM prime minister Vasil Tarlev. One of the topics being discussed is the Odessa-Brody oil pipeline and its possible extension to Plock. GUAM was set up partly to reduce energy dependence on Russia, so all of this sounds quite promising. But egghead James Sherr provides a more sober picture of Ukraine's position in an interview in 'Glavred'. "... the main political forces in Ukraine are divided in terms of those directions, which actually are significant - NATO, Russia and energy policy and security. Only a few months ago it seemed that GUAM could become a point of resistance on the question of energy safety - in particular concerning the reduction of energy dependence on Russia. But how can Ukraine lead these efforts, if its ministry of power is doing all it can to increase this dependence? If Ukraine itself does not know what she wants and where she is going, how an she be the leader of something?" - asks Sherr. The National Security and Defence Council of Ukraine discussed the unsatisfactory state of national energy security last Friday, but minister for fuel and energy Yuriy Boyko, and deputy prime minister Andriy Klyuyev, seemed to have managed to avoid sustaining major damage. Some say the NSDC meeting was cut short because the president and others wanted to rush off to meet Elton John at Viktor Pinchuk's art gallery later that day..
p.s. Experts suggest that Kazakhstan could join GUAM at some time. Makes for an interesting word puzzle - gukam? gmuka? gumak? "..one thing has become apparent: either politics is one big bluff, or high society life is one big hypocrisy..Where else can today's president, Viktor Yushchenko be seen embracing his enemy Leonid Kuchma?" - from an article in 'Tabloid' which includes several [illicitly taken] photographs of the bash at Viktor Pinchuk's art gallery during this weekend's visit by Elton John to Kyiv. The blonde with the big teeth and gold-chain dress-straps in the photos is Olena Franchuk - Leonid Kuchma's daughter and Viktor Pinchuk's wife. How Franchuk and Pinchuk made easy millions from Kyivstar, the largest mobile phone operator in Ukraine, with well over 20 million subscribers, can be read here. CEO of Kyivstar was Yuriy Tumanov - Kuchma's brother-in-law. On Saturday Sir Elton John is staging a concert on the Maydan in Kyiv, but today president Yushchenko and his wife opened an exhibition of photographs from Sir Elton's private collection which being shown at the Pinchuk Art Centre. Sir Elton thanked Viktor Pinchuk's wife - ex-pres Kuchma's daughter Olena Franchuk for her anti-AIDS charity work. The bash was attended by BYuT deputy Yevhen Hubskiy, NU's Petro Poroshenko, and Industrial Union of Donbas boss Serhiy Taruta. Also 'brown-nosing' were Kuchma himself, ex-PM Yuriy Yekhanurov, transport minister Mykola Rudkovsky and minister for emergencies Nestor Shufrych. Some photos here - looks as if Andy Yush was there too. Yesterday US ambassador in Ukraine William Taylor visited the Donbas region, and was interviewed by journalists of "Donbass" newspaper. He had visited a mine in which Ukrainian and US specialists were working together to improve safety. He praises Ukraine's high economic growth rate, but says that the early VR elections are slowing down foreign investments. He claimed that Yanukovych made a good impression and helped to improve the image of Ukraine in the eyes of American people during his recent visit. Yuliya Tymoshenko's visit proved to be successful too, and he hoped that soon other Ukrainian politicians and statesmen would visit the USA, although this is unlikely before the elections take place, "because we would not wish the impression to be created, that the US Government is interfering in the Ukrainian election campaign." PoR have had to respond to president Yushchenko praising Rinat Akhmetov for helping regulate the current political crisis. There had been signs that Akhmetov and his closest PoR associated eg Boris Kolesnikov were more favourably disposed to holding early VR elections that Viktor Yanukovych. The first deputy leader of the PoR VR faction Vasyl Kiselyov today declared that he considers President Yushchenko's lauding of Rinat Akhmetov to be 'incorrect' and 'tactless'. Kiselyov, when asked to comment whether it had been Akhmetov that was negotiating with the president about of early elections replied: "Akhmetov and Yanukovich are as one. He and Yanukovych maintain one line." An article in 'Glavred' suggests that a friendship may indeed be developing between Akhmetov and president Yushchenko, causing a rift between Akhmetov and Yanukovych, who was not as keen on early VR elections as Akhmetov. Early elections were in no way part of Yanukvych's plans - he had expected to be head of government for years to come. Glavred suggests that Yanukovych and Akhmetov have a different strategic vision for PoR in the new parliament. Yanukovych wants to recreate the present configuration of the recent ruling majority the VR, while Akhmetov is convinced that for political stabilization in Ukraine it is necessary to negotiate with the President and his party, possibly, even giving his supporters several key posts in the government. Today the pre-election campaign of "Regiony" is at its initial stages. The central selection of party nominees will most likely be led by Boris Kolesnikov. There could well be changes to their existing list of deputies - some of Anatoliy Kinakh's party, as well as Socialist Vladimir Boyko, head of Mariupol metallurgical combine im.Il'icha, and some of their supporters could be included. Ukrainska Pravda today publish portions of leaked briefing material and draft resolutions that are supposedly to be presented at tomorrow's National Security and Defence Council meeting. Having formally dealt with the current political crisis with the government, Yushchenko is seems, will now tackle economic politics, in particular its most painful aspect - shortcomings in energy security. Yanukovych will now have to defend RosUkrEnergo from the president, who, it seems is relishing firm and forthright action more and more. The 33 pages of material read "like a political thriller", according to UP. Particular attention is paid to Naftogaz and RUE, and to their off-spring UkrGazEnergo. At the beginning of 2006, when RUE became monopolist supplier of Turkmen and Russian gas in Ukraine, Yushchenko claimed he did not know who its Ukrainian owners were, and even consulted Vladimir Putin on this matter. UP claim most of the stuff was prepared when Vitaliy Hayduk was still secretary of the NSDC. LEvko says this could be a big story..and there have been straws in the wind..
RUE's and other middlemen's skimming off of funds is obviously detrimental to Ukrainian consumers, and to large Financial Industrial Groups in particular - its time the parasites were made redundant. It remains to be seen what political capital will be gained by political rivals during the oncoming VR election campaign from this affair. At a press conference yesterday, president Yushchenko, in a convoluted and long-winded manner, offered some praise to Rinat Akhmetov. "I would say that the association that I have with this person prompts me to tend to say that that there are constructive positions being formed in this person with regard to national development paths. I recall discussions which took place during the political regulation [period]. I can say that this person held important and beneficial positions on regulating the political crisis. I would like journalists to know this," said Yushchenko. 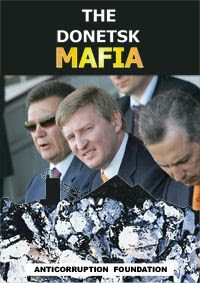 Its not so long ago that that Akhmetov made himself scarce [after the OR] and 'The Donetsk Mafia' book was distributed at NSNU party conferences..
RosUkrEnergo, Firtash, and a car smash..
Firtash holds 90% of Centragas Holding AG shares, who, in turn own 50% of RUE. 'Ukrainska Pravda' covered the car smash, and its consequences several days ago. 'Segodnya' reveals that on Monday an attempt was made to smuggle Kalinovskiy out of the country on a chartered aircraft from the small Zhulyany airport in Kyiv. He was hastily returned to a private clinic where is being guarded by private security after the attempt failed. In yesterday's posting about RUE and the elections I wrote "irreconcilable rivals PoR, BYuT, NU, and Socialists are however linked by a common objective - a low price for gas for Ukrainian industrial enterprises, and businessmen from all political camps will co-operate in order to obtain this.."
Ukraine's biggest businessmen have had enough of dealing with shady middlemen - they want to deal with the 'organ grinder - not the monkey'. And this story is gift of an opportunity to bring down Firtash a rung or two. The two victims of the car smash were a ministry of internal affairs officer Volodymyr Kulikovskiy who was on his way to work as a security official at the Japanese embassy, and Kalinovskiy's 25 year old girl friend Anastasiya Bronnikova. Her funeral was attended by many well-known politicians and their 'golden children', including the president's son. Today's 'Gazeta po Kiyevski' carries an article entitled 'Russian roulette', speculating whether RosUkrEnergo will become a 'political football' in the September 30th elections. In Spring 2006, during the VR election campaign, the negative image and possible harmful activities of RUE for Ukraine were highlighted exclusively by BYuT and Yuliya Tymoshenko. Her attempts in 2005 to cut out RUE from the gas supply chain cost her the PM's job, and caused a seismic split in the orange ranks. Now business interests and election technologies are so tightly interwoven that the shady gas intermediary may well become the object of criticism, not only from the orange NU and BYuT, but from the Communists and Sotspartiya too; and even possibly from part of the members of PoR - if this is secretly agreed by the main financial players. In the opinion of the general public "RosUkrEnergo" is normally associated with "Regionaly". RUE is the monopolistic supplier of Russian and Central-Asian gas to Ukraine since 2006. The official start of the PR attack on RUE has begun with the head of the SBU Mr. Nalyvaychenko's interview in today's 'Financial Times', in which he promised "that Russia and Ukraine would this summer provide greater clarity about the natural gas trade, in which the controversial RosUkrEnergo company plays a vital role. 'Ukraine and Russia should make this situation more transparent. [We need to show] what the real prices are and what the real financial sources are here, the flowing of money, and risks of dirty money and money laundering. To know the real situation, the real operators, the real deal, is key'." The SBU head's 'FT' interview was most likely sanctioned by Pres's secretariat, where Nalyvaychenko is considered a hawk. The SBU and Nalyvaychenko personally participated in the discrediting of the Consititutional court judges Stanik and Psenychniy, who were examining the constitutionality of President's Decree on the dismissal of the VR. But at the most, the presidential side and NU will limit itself to indirect hints of participation of "Regionaly" to the shady schemes of RUE, without the naming of concrete personalities and facts, and all the more - criminal cases from the SBU, since the response would be a wave of compromising material on the people close to the President, and in particular, on the President's brother - Petro Yushchenko. He could be connected with a certain off-shore company "Petrogaz" whose office is located in Dubai. "Petrogaz" is allegedly one of the minority shareholders RUE. In two and a half years Yushchenko has only on few occasions spoken negatively about RUE, and has not undertaken any concrete actions on its elimination. NU started to agitate against the activities of RUE only after pressure from Yuliya Tymoshenko. PoR during the election campaign will emphasize two facts: First, because of the mediator RUE and the Yanukovych government's handling of matters, Ukraine has gas from Russia at 130 dollars, instead of the initially proposed to 230, and PoR has no concrete links with RUE. Secondly, Yushchenko and Tymoshenko themselves have their snouts into the trough. Possibly, the Donetski-controlled media will rake up dirt on Petro Yushchenko's role, and Tymoshenko will be linked to attempts to return for the intermediary 'Itera' to the gas market. The irreconcilable rivals PoR, BYuT, NU, and Socialists are however linked by a common objective - a low price for gas for Ukrainian industrial enterprises, and businessmen from all political camps will co-operate in order to obtain this, i.e. Ihor Kolomoyskiy (of the "Privat" group), who is considered to be one of the sponsors BYuT, Vladimir Boyko (owner of the Mariupol Metallurgical Combine im. Ilyich), SPU financial sponsor, Rinat Akhmetov (chief financier of PoR) and Vitaly Hayduk ( of ISD), a businessman close to the President. The fact is that the the sister company of RUE "UkrGazEnergo", which exclusively supplies gas to industrial enterprises, recently increased its gas price, after including the cost storage of gas. Since the beginning of June both Boyko and Hayduk refused to buy gas, and turned for fuel to traders of the "Privat" group, who had earlier obtained and stored cheaper fuel with "UkrGazEnergo". The"Privat" reserves will soon be exhausted and Akhmetov himself has been forced to accept an increase in the price from UkrGazEnergo and signed a new agreement. Thus, the largest sponsors of the main political parties are being hit hard and are extremely negatively disposed to RUE. This will naturally be reflected in the rhetoric of party leaders and pre-election slogans. An article in today's 'Gazeta po Kiyevski' claims Yanukovych has finished with Moroz and PoR are preparing for the early elections. Yesterday's statements by the premier, and the actions of companions-in-arms in his party show that "Regionaly" will no longer fight with the President over the question of early elections, and are themselves beginning preparations for the election campaign. After the president's 5th June ukaz ordering VR elections for 30th September, Viktor Yanukovych kept silent; and in the aftermath of hysterical proclamations from VR speaker Moroz and some PoR members, experts were forecasting another round of conflict over Yushchenko's ukaz, but no challenge was forthcoming. Yesterday Yanukovich finally spoke out, supporting Yushchenko's ukaz. "It practically supports all the understandings, which were made in [our] declaration," he said. He promised the government not will dispute the legality of the ukaz in the constitutional court. Moreover, it is possible to assert the following: if VR speaker Moroz does not calm down and continues his games with the judicial actions, then "Regionaly" will block this process. Voters in the southeast cannot yet understand why he made concessions in favour of the President, so Viktor Yanukovych yesterday added that, in spite of Yushchenko's ukaz, the Verkhovna Rada of the 5th convocation remains legitimate. "Until a final ruling is made or an explanation is given by the constitutional court, the VR will continue to function," the premier stated. Yanukovych did not go into detail into what final ruling he had in mind. Furthermore, he knows well that Yushchenko will not sign any law passed by the VR. Yesterday Yushchenko gathered together foreign ambassadors and informed them on behalf of the Ukrainian state that the VR's authority has been terminated. He asked diplomats not to associate with the VR leadership or the remaining deputies in their capacity as official representatives of Ukrainian authority. In other words Yushchenko has publicly stated that Moroz is an nobody in the state hierarchy. Interestingly, no reaction followed from Yanukovych to such a frank attack on his recent ally. This silence says much. It is clear that the period of conflict is now over. This became apparent after the distribution of new posts in the Prosecutor-General's office and in the Central Election Committee, and the adoption of necessary laws for the elections, proposed by "Regionaly". The two Viktors have finally agreed. Although, as before, they have not weakened, and expect further dirty tricks from each other. The Yushchenko-Yanukovych truce means final defeat for Moroz. San Sanych [Oleksandr Oleksandrovych Moroz] has lost everything, particularly the "golden share" of the Sotspartiya in the VR coalition. He has now served his purpose..
Today's "Kyiv Weekly' in an article entited "Parliamentary elections: the hawks have landed!" [in English], is not quite as optimistic and describes problems that may arise in the run-up to the elections. And RBK reports that 30 BYuT deputies want to reactivate their activity in the VR, even though 103 of their number have supposedly 'ripped up' their VR deputy mandates. BYuT deputy Oleksandr Kovtunenko is quoted as saying that a working group of 30 has been formed. Amongst them are those that do not agree "with the hysteria created by the leader of the bloc." LEvko thinks some of these guys paid big money for a seat in the VR and so are not best pleased with what is happening..
Discontent with all parties spreading.. Gloomy predictions of Ukrainian political scientists are beginning to come true. In spite of ostensibly achieving compromises, the political situation in Ukraine continues to be rooted to the spot. A number of political forces continue to disrupt the negotiation process in order to avoid, at any price, the early elections due on 30th September. Some politicians in every political force are trying to stop or at least slow down the process. They all claim concern over adherence to the law, but the true reason for their actions is fear of losing the elections. ... It's no secret to anyone, that many deputies paid big money (unofficial sources say from four to seven million dollars) for a place in the parliament. VR speaker Oleksandr Moroz declares that until the Central Election Commision confirms that opposition deputies have revoked their mandates, the VR cannot be considered illegitimate, and therefore its work continues. "Zerkalo Nedeli" wrote that 'Sotspartiya' does not have any chance of success in the elections, and is having legal action brought against it. In order to avoid a similar fate, let us say the Sotspartiya has splendid chances and Moroz will gain almost all the places in parliament. And yet they are attempting to sabotage the elections. What's the problem? Maybe they don't want victory? Vadim Kolesnichenko (PoR) considers that the political conflict in the Ukraine, "is only beginning to flare up". He does not exclude the possibility that, "In autumn it will be necessary to adopt some extraordinary measures". He properly indicates there are legal time-bombs placed under the future parliament. According to the deputy, it is possible to assume: "Elections will take place, but there will be no change to the present situation. What happens next? The side, which lost, does not take up its mandates. And then, according to the constitution, the Supreme Rada will not be actually formed by the two thirds of deputies, as required by the constitution. We already heard several times, and sighed with relief that, "They have found a compromise, and the crisis is behind us". But next day everything continues as before in the traditional way. In their present composition the politicians cannot achieve a position to suit everyone - someone inevitably loses. We may conclude that qualitative changes are necessary, i.e. cancellation of elections by party lists. But this most honest of solutions greatly frightens many influential politicians, who only have chances with party list systems. And it is they that make the decisions. The only notes of optimism during the entire political crisis are government continues to work, because according to the constitution the government can only be sacked by the Supreme Rada, and the crisis is not affecting the social and the economic sphere for the time being. But in a normal state, its parliament must continue to work. Laws must be passed, and some changed - today this is practically impossible. What factor of safety is there in the country? How can it progress with paralysis of one of the branches of authority? The adviser to the President questions of law, Stepan Havrish asserts that the President will sign no laws passed by the present VR, since it has ceased to be legitimate. But deputies continue to work - the result is zero - a blind alley. Politicians from any one party are today not capable (thank goodness) to completely control the country. For them to reach a concensus is very difficult. The nation [narod] waits. If today's politician cannot sort out the problems, they should take a look at what happened to the old Communists. As it says in the constitution: the 'narod' is ultimately the main bearer of authority. "Parliament speaker Oleksandr Moroz said at a session of the Verkhovna Rada on June 5 that those lawmakers from the opposition Our Ukraine and Yulia Tymoshenko Bloc who withdrew last week did so in violation of relevant procedures. According to last month's deal between the president, the prime minister, and the speaker, the opposition lawmakers were to withdraw to make the Verkhovna Rada illegitimate, thus paving the way for its self-dissolution and early polls in the fall. Moroz said the pullout of lawmakers should have been announced in the session hall and confirmed by him. "But this has not been done since, firstly, many deputies were absent and, secondly, there are absolutely substantiated doubts that the resignation statements were signed by the people named in them," the "Ukrayinska pravda" website quoted Moroz as saying. "Unless the Central Election Commission signals to us that there is no one to replace those [deputies] who pulled out, and that those who pulled out have been stripped of their deputy powers, parliament will continue to work," he added. Moroz also asserted that nearly 40 lawmakers from Our Ukraine actually do not want to give up their parliamentary seats, UNIAN reported." 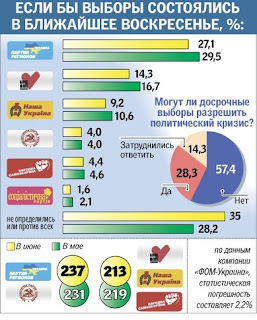 Latest OP has PoR at 28.5%, BYuT at 20.1%, NU at 5.8%, Lutsenko's National Self-Defence at 5.3%, and Communists at 4.1%. Socialists, with 2.3% would fail to enter the VR in early elections. Hence Moroz's desperate sabotaging..
LEvko thinks NU lack an attractive 'front-man' for their campaign so will struggle to gain any greater support; and these figures explain why BYuT were so keen on raising the minimum threshold for admission to the VR to 7 or 10%. Lutsenko will be pleased too, and his political movement may be gaining momentum. The OP figures, if repeated on September 30th, could well produce a PoR-NU coalition..But that is still a hell of long way away. I quite enjoyed reading this article in 'Kyiv Weekly', entitled Political showdown "Ukrainian style - senseless, yet compromising"
Unlike in the fall of 2004, Ukrainian citizens today prefer to remain on the sidelines as "observers" of the political games. Representatives of the coalition and the government already on the second day after the president’s decree on the dissolution of the Verkhovna Rada confused society with a warning that the economy may soon collapse and threatening that social programs would not be fulfilled. In reality, everything was the other way around. The economy has positive growth indicators: GDP growth in January-April was 7.9%, industrial output – 12.5% and investments into fixed assets grew in Q1 by 33%. These figures point to two facts. First of all, as long as the prices of metal on world markets remain high, no political crises will threaten the Ukrainian economy – unless of course a civil war breaks out. Incidentally, industry experts forecast a drop in the price of metal products exported from Ukraine in June 2007. Secondly, it is evident that there is a gentlemen’s agreement among the political echelon to not interfere in the businesses of political opponents. This shows that some lessons were learned from the re-privatization campaign of 2005. The economic basis for such a compromise is the sufficient amount of state-owned assets that may be soon put up for sale, not to mention the possibilities of "feeding" off the budget. As paradoxical as it may seem, Rinat Akhmetov and his large private business are the economic foundation of the "party of peace" (i.e. that which agreed to holding early elections), while those politicians who control the budget (Finance Minister Mykola Azarov and VR Speaker Oleksandr Moroz) represent the "party of war". Despite the waning authority of the political elite, Ukrainians do not seem to show any desire for an "iron-fisted leader" coming to power. This essentially puts society in first place in terms of dialog with the government and business and means that the current political crisis is making room for a civil society in Ukraine, not one that continuously seeks grants, but one that controls and directs governance.